Basseterre, St. Kitts, February 11, 2019 (SKNIS): Leading up to the commemoration of the 4th anniversary of the Government of National Unity on February 15, Cabinet ministers led by Prime Minister Dr. the Honourable Timothy Harris today, February 11, visited several manufacturing plants at the industrial site in Basseterre and Sandy Point. The prime minister noted that the government will continue to be interested in the workers’ welfare, progress and development. “We are here for you and we will always be there for you,” said Prime Minister Harris. 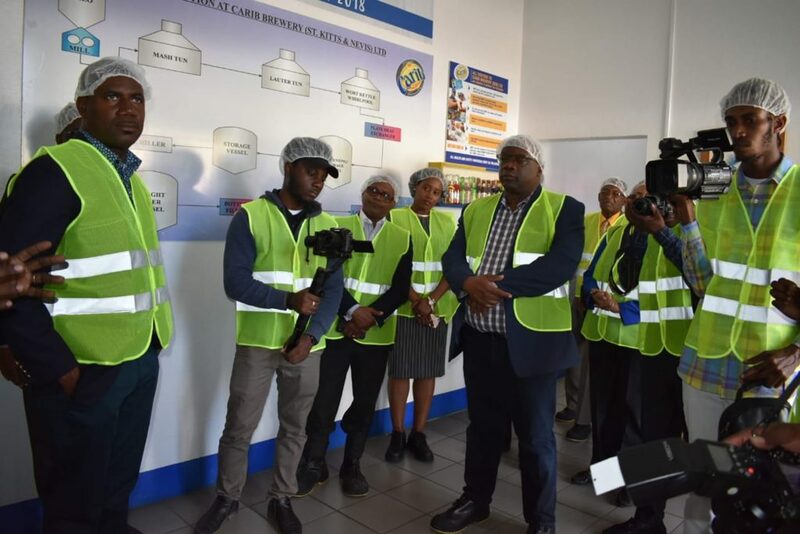 The Cabinet members visited Lutron Liamuiga, Kajola Kristada, Jaro Electronic, St. Kitts Carib Brewery and Harowe Servo in Sandy Point. The delegation included the prime minister; Deputy Prime Minister, Honourable Shawn Richards; Senior Minister and Minister of Labour, the Honourable Vance Amory; Honourable Lindsay Grant; Honourable Eugene Hamilton; Attorney General, Honourable Senator Vincent Byron; Senator Honourable Wendy Phipps; Deputy Speaker, Senator Akilah Byron-Nisbett, and Cabinet Secretary, Mrs. Josephine Huggins. Permanent Secretary in Ministry of Labour, Ron Dublin-Collins, Labour Commissioner Shernel James and Assistant Labour Commissioner Deon Webbe were also present at the walkthrough. The presence of the Cabinet gave added support to the significant role the factory workers play in national development and the empowerment of citizens. It provided the opportunity for the Cabinet to interact with management and workers on matters of interest and concern. The members were also able to see firsthand the operations of each plant.